What are the differences between Sunni and Shi'a, Catholic and Protestant, Buddhism and Confucianism? Who were Moses, Jesus and Muhammad, and what did they really preach? Why are the concepts of karma, jihad and nirvana so important? And what do the religions of the world say about life, death and how we should act?Learn about the religions of the world - in minutes. What are the differences between Sunni and Shi'a, Catholic and Protestant, Buddhism and Confucianism? Who were Moses, Jesus and Muhammad, and what did they really preach? Why are the concepts of karma, jihad and nirvana so important? 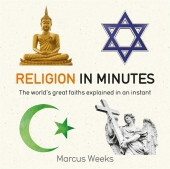 And what do the religions of the world say about life, death and how we should act?Answering these and many other critical questions, this book explains the histories, key texts, prophets and essential teachings of the ancient and modern religions and their offshoots, including:Judaism, Christianity, Islam, Hinduism, Buddhism, Sikhism, Greek, Roman and Norse mythologies, indigenous traditional religions, Zoroastrianism, Jainism, Daoism, Confucianism, Shinto, Catholicism, Protestantism, Anglicanism, Baptists, Methodists, Puritans, Mormons, Sufism, Hasidism, Scientology, Baha'I, New pagans and many more, as well as considering their common themes and the future of religion.Clear, concise and with 200 iconic images, Religion in Minutes is the fastest, fullest way to understand the beliefs that shape the world around us.Marcus Weeks ist Autor, Musiker und Querdenker. Er hat an zahlreichen Enzyklopädien mitgewirkt, erweitert ständig seine Sammlung von Wörterbüchern und verfasst Kreuzworträtsel.